Lightly sweetened, slightly chewy, and a little bit flakey. 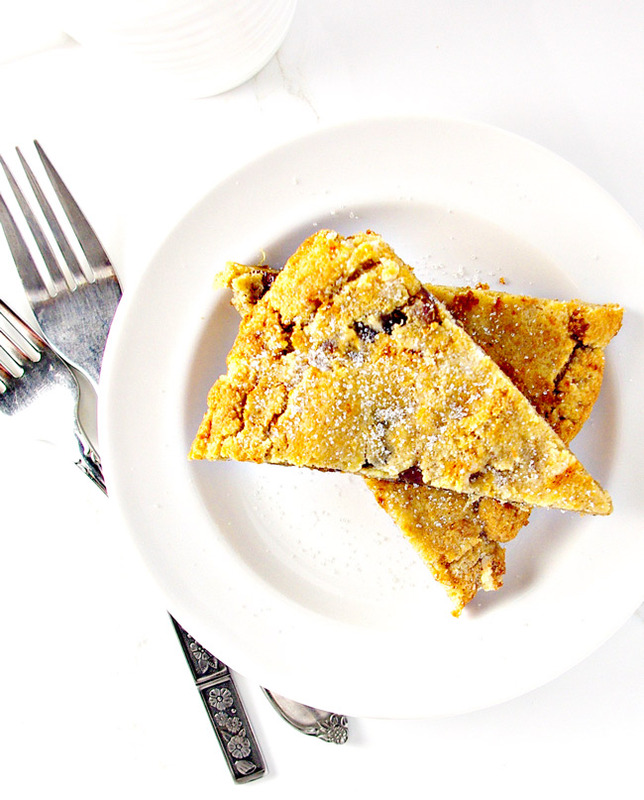 These are just a few ways to describe Grain-Free Cinnamon Scones, and I am out of my mind about it. Twinkle isn’t any better. She kept grabbing more handfuls while I photographed these tasty treasures. It’s love in our household, Spiriteds. I don’t even know where to begin with this recipe because it has been quite a journey to discover it. 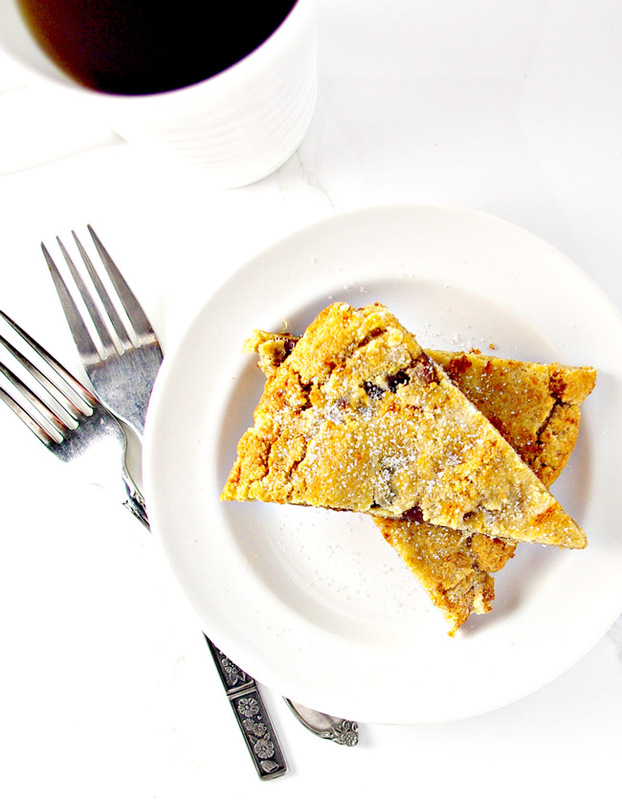 I suppose these Grain-Free Cinnamon Scones started when Toodle discovered Harry Potter. HP is a whole thing in our house. Even K-Hubs, who was dubious about the series when it first came out and prefers magazines, radio, the History Channel, and ESPN to every other media option out there, is as bonkers about Harry Potter as Toodle and I are. In fact, total side note, when the first movie came out, K-Hubs and I were still newly dating. I asked him to tag along with me to the movie, and because he wanted to make a good impression, he reluctantly went along. That was the end of that. By the time the second movie came out, this Hufflepuff was calling me from work offering to purchase advance tickets so we didn’t miss opening night. And by the final movie, we had had Toodle and he was in tears with me over the whole Snape/Lily flashback, and this is where I have to stop. For my heart can take no more. Now we are reading the books, watching the movies, completing appropriate online sorting quizzes, and digesting the themes. Like me, Toodle is a Ravenclaw and fascinated with Hogwarts feasts. So we embarked on our own paleo-ish Hagrid’s Rock Cakes recipe. The result was good enough for a family movie night but not Spirited blog quality, so I kept making them, trying to improve the recipe. One attempt resulted in coconut oil and cinnamon all over the oven. Burned cinnamon doesn’t smell as bad as one might think. Potpourri for everyone! Another attempt resulted in some pretty weird, bitter flavors. Yet another attempt, this time to bind the ingredients better together and reduce some of the bitterness that comes with using baking powder, turned into this recipe. And while I don’t refer to it as Hagrid’s Rock Cakes, Grain-Free Cinnamon Scones are definitely inspired by the concept. 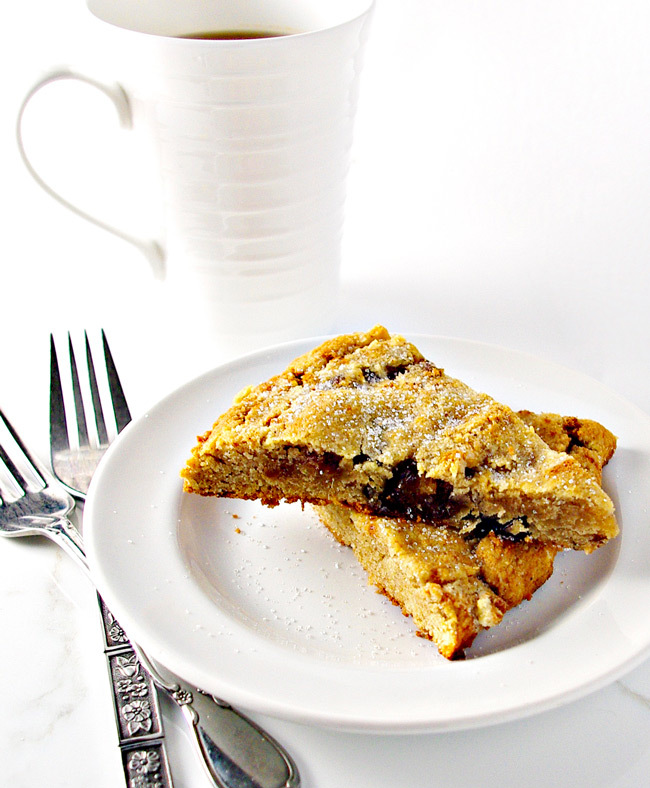 Much like creating them, deciding what to call Grain-Free Cinnamon Scones was also quite the undertaking. I even did a little research into this whole business. Apparently, there is a “to-do” over the differences between biscuits and scones. Scone enthusiasts insist scones and biscuits are not the same thing. Fine. We’ll just avoid the debate entirely and not use the word biscuit to describe these delicious cinnamon treasures. And then there was a whole to-do about British and American scones. I’m not even remotely qualified to weigh in on that. So then I pondered whether this is a coffee cake. Although Grain-Free Cinnamon Scones, as their name suggests, contain cinnamon, much like a coffee cake does, that title didn’t feel right either. So I’m sticking with scone. 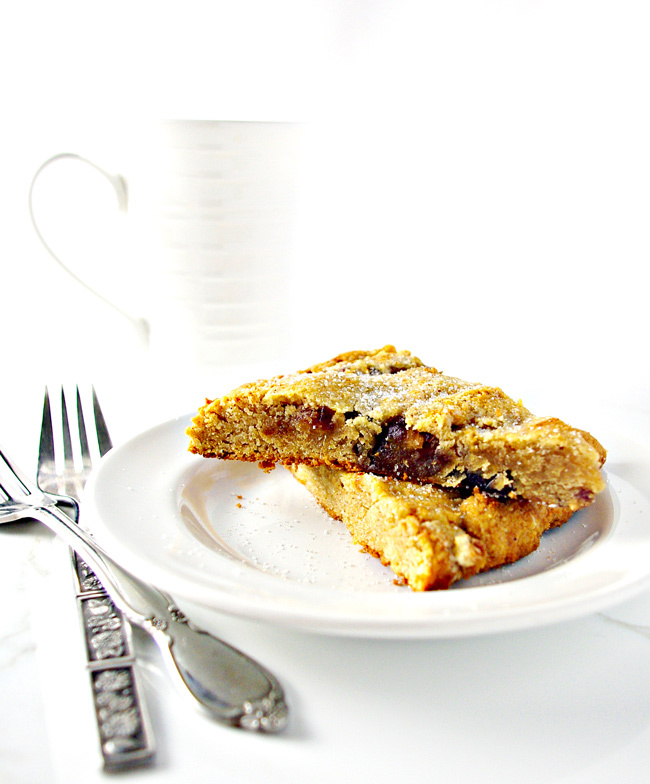 And these scrumptious Grain-Free Cinnamon Scones epitomize deliciousness, never mind they are also gluten-free, grain-free, and soy-free. To make them, simply add the wet ingredients to the dry ingredients and whisk away! I did stir the almond milk and egg together first in a separate bowl, and I chose to add the chopped dates by hand. 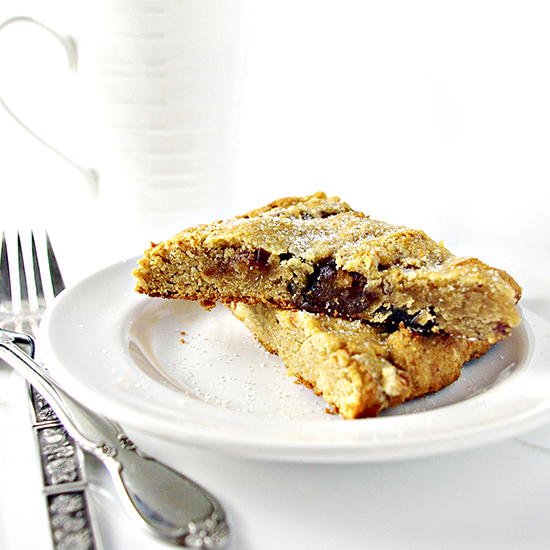 But essentially, this is a fairly easy grain-free scone recipe. As for baking them, that isn’t hard either. But it does require a little attention to detail, especially if you don’t like burned edges. I bake Grain-Free Cinnamon Scones for about 15 minutes uncovered on a baking sheet, rotating once halfway through baking time. Then I loosely cover them with foil and bake another 2-5 minutes. Then I set them aside to cool, slice them with a pizza cutter, let them cool more, and finally dig in! Whatever debate there may be about labels, there is one label our whole family agrees describes these Grain-Free Cinnamon Scones. Combine almond flour, coconut flour, baking soda, sea salt, cinnamon, allspice, and nutmeg in a large bowl. In a separate bowl, whisk almond milk and egg together and pour on top of dry ingredients. Add melted coconut oil, agave nectar, and vanilla and whisk all ingredients together. Mix in dates by hand. Spread mixture into the shape of a circle on a baking sheet. Pat into place until the dough is about a half-inch thick. Bake uncovered for about 13-15 minutes, rotating the baking sheet about halfway through. Then cover loosely with foil and bake another 2-5 minutes. Remove from oven and let cool for about 10 minutes. Then use a pizza cutter to slice 8 wedges. Leave on baking sheet for about another 10 minutes to allow them to cool even more (heat will escape once the wedges are cut).